She terrified you in The Conjuring, but this is where it all began for Annabelle. Capable of unspeakable evil, the actual doll exists locked up in an occult museum in Connecticut—visited only by a priest who blesses her twice a month. New Line Cinema's supernatural thriller Annabelle begins before the evil was unleashed. John Form has found the perfect gift for his expectant wife, Mia—a beautiful, rare vintage doll in a pure white wedding dress. But Mia's delight with Annabelle doesn't last long. On one horrific night, their home is invaded by members of a satanic cult, who violently attack the couple. Spilled blood and terror are not all they leave behind. The cultists have conjured an entity so malevolent that nothing they did will compare to the sinister conduit to the damned that is now... Annabelle. 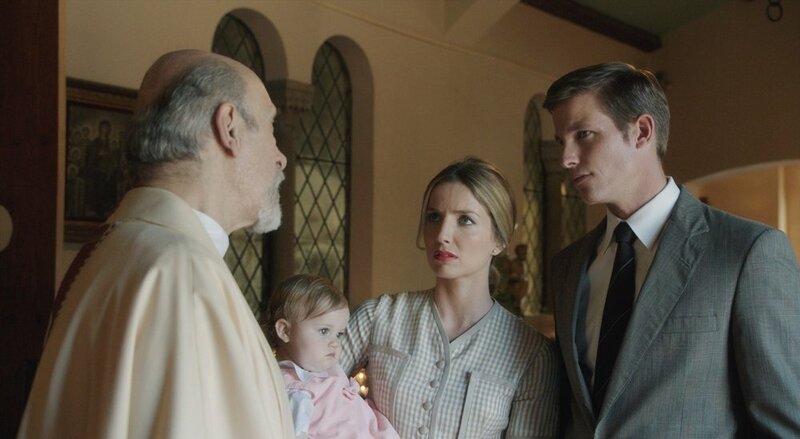 Annabelle Wallis (X-Men: First Class) and Ward Horton (The Wolf of Wall Street) star as the Forms. Oscar nominee Alfre Woodard (Cross Creek, Twelve Years a Slave) stars as Evelyn, a neighbor who owns a bookstore. Rounding out the cast are Kerry O'Malley (TV's Those Who Kill) and Brian Howe (Devil's Knot) as neighbors Sharon and Pete Higgins; Tony Amendola (TV's Once Upon A Time) as Father Perez; and Eric Ladin (TV's Boardwalk Empire) as Detective Clarkin.